I recently participated in a photo walk in Jaipur “See The Unseen” conducted by a photography club for The World Sight Day on 12th October. This Jaipur Photo walk took place in the old city area of Jaipur and was attended by a large number of photographers – the highest in any photo walk that I have attended. Participating photographers were paired together. One of them would click pictures while the other would be a navigator. The underlying idea was that the photographer needs to click pictures with a blindfold -it was a Street Photography without relying on one’s ability to see! Since the event was for The World Sight Day, photographers were asked to click pictures relying on other senses like sound. That’s how a blind person clicks pictures. After a designated time, both would switch places. The photo walk took place on a Sunday morning. It created a lot of stir as people on the road were amused to find blindfolded people armed with a camera clicking pictures. Many of them couldn’t contain themselves and came up to ask what this was all about. The walk started at 7.30 AM even though the designated time was 6.30 AM. By 8 AM the bazaars were buzzing with activities. Devotees at the temple, morning walkers congregating at eateries for the Sunday breakfast and Chai shops… the excitement and subjects swelled as the clock progressed. I also captured a few frames blindfolded. It’s a different ball game when you lose the concept of composition. You are out of your comfort zone; just bring the camera on your eye level and click! A few important elements of photography like leveling the horizon, changing aperture or ISO settings become irrelevant. I shot the following pictures at a fixed setting – blindfolded. This sweeper was distracted upon seeing a blindfolded lady with the camera! These rickshaw owners were amused to find a blindfolded person taking a shot at them and inquired what this was all about from the accompanying navigator. They demanded money for being subject. Upon realizing that there’s no money to be made here, they settled for tea instead! I guess they just weren’t lucky! Breakfast point – The Poha seller! Let’s light up a joint! Street urchins waiting for the free food in front of a temple. Vegetable seller outside a temple. Sometimes you get it right, too! If you are wondering how I shot these images, have a look at the below set of pictures which has a group of people chanting Bhajan on their way to the temple. You have to keep clicking in succession hoping you will get at least one right! I stood still and kept pressing the shutter button -one after another. This is the last picture I shot blindfolded! It was time to switch places with the navigator! The concept was novel and none of the participants were aware as to how the walk will unfold until they were briefed. Unlike earlier photo walks in Jaipur, this walk ended with press coverage. So what was great about this photo walk? One, as a photographer you get exposed to the novel concepts which are important for your mental stimulation. Two, it is also a place where you can mingle with other photographers. Three, it’s great to see so many photographers attending a photo walk in Jaipur cutting across the age and gender. Four, there was no prerequisite of photography equipment. One could click pictures with DSLR, point, and shoot/ compact camera or a smartphone. I have mentioned in my previous post that generally, I avoid photo walks because of distractions and concentration on the specific subjects but sometimes we need to break out of our shells and see things from a fresh perspective. Streetlife photography is an enriching experience. Street Photography in Jaipur is quite rewarding with varied subjects and buzzing bazaars. Photography on Streets of India is a highly rewarding experience, something that Indian photographers will vouch for. Generally, people are okay with their pictures being clicked…..but there are exceptions too! TIP: For Street Photography you must be in the right place and the right time. What a super idea, an insight into the unsighted and some great results. Well done. Thanks, Ellen. I’m happy to note that you loved the idea. Are you into street photography? I am not really very good at photography but I am going to try a version of this, just two of us though on a walk in the countryside today and see what I get. Who knows feeling the shot might make my pictures better. What an intriguing idea and have to say, as a photographer, I’ve never tried taking photos blind-folded. I’m not sure my photos would turn out as good as yours! Well, with our “eye” out of scene, we are all equal. So I’m positive that you will enjoy this experience. 😃 Do you find Jaipur different from the one you saw 38 years ago? Amazing photographs, thanks for the inspiration I truly love your blog !! Nice pictures and awesome writings, I am also photography lover and want to know which lenses are you using and on which aperture and iso setting you are using to capture this images? Please Tell me more details about these photos. Thanks, Aysha. I have a variety of lens. But I also click pictures with super-zoom camera and a smartphone. As for setting in DSLR it is dependent on light and purpose. If you have any specific picture in mind, let me know; will share details. It sure is. It was all a fun moment. I’m happy you liked it. Well, it’s not easy to click pictures blindfolded. But then that’s the fun part 😃. Thanks for sharing your thoughts, Amy. What a great concept. You get to hone in on your other senses whilst having to put your trust in another to keep you safe. It is interesting to see how good the photos are that you took blindfolded. I might borrow the idea. Yes I will definitely let you know when I have a buddy to attempt it with. Great idea. Such a cool and fun idea! Not to mention the deeper level of it. I think the photos you took while blindefolded were very nice. I’m impressed! I’m delighted to heat this. Thanks, are you also into the street photography? No, but I do like to take alot of photos! Thanks, Soundarya! Your words are inspiring. Where are you based? Ah! Great. I have some great memories from Chennai. Oh wow! I like this idea! This is so cool! Its been a long time here in the blog we spoke. Hope you are doing great. Yes, we haven’t interacted of late. I remember your last series on Varanasi but you haven’t written for quite some time. Hope all is well at your end? Yes, I haven’t written in a while on my blog. But I am hoping to come back from this August 1st. So all good so far at my end. How are you? Great. Going OK. Thanks for asking. 😃 Will look forward to your post. Good to know. My post will come soon. An innovative idea for a photo walk. The way I see it, it is also directed towards a more inclusive society, to raise empathy and understanding (amongst the general populace) on the challenges faced by the visually impaired and yet their ability to create wonders all the same! Absolutely amazing concept! And you did a great job. Loved the monochrome touch on these pictures. They bring out the soul of the city very well. Thank you for sharing! I am going to search about Bangalore’s photo walks now. I’m glad you liked this post and pictures. I’m sure you will enjoy photo walk in Bangalore. If not going solo is great too. Most of my walks are solo. Allows me creative freedom. Although quite challenging, I must admit, this does sound like a lot of fun. Would definitely like to try something like this myself as well! what a beautiful idea to capture the essence of the place. 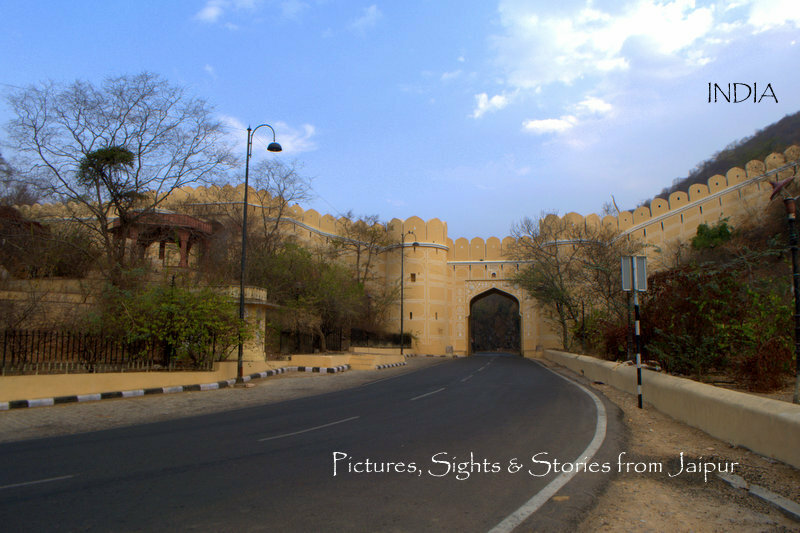 loved your blog, so much to know about Jaipur! This is such an innovative concept. Never knew that one can take photos blind-folded (ignorance from my side, totally). The pictures came out so well. 🙂 Now going to search for whether this walk happens in Kolkata. I’ll be up for it, absolutely. Wow..jaipur is beautiful. Lovely pictures through your lens. I have never been to Jaipur but would love to visit soon.